This renowned tennis label has been around since the game was invented. 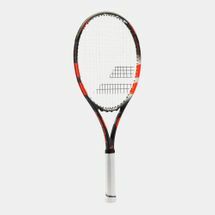 Babolat offers a complete range of products for tennis and badminton players, with an offer to suit every style of play. Gear up like a Wimbledon pro with the latest gear from this tennis staple. Browse the Babolat online store right here at Sun & Sand Sports online. Babolat tennis racquets offer you power, control, and everything in between. With such a wide selection to choose from you can find a tennis racquet with the right feel. Babolat racquets are created for the best performance, as evident by their use by many renowned ATP and WTA players such as Rafael Nadal, Sara Errani, Jo Wilfried Tsonga, and many more. This series is split into Pure Strike, Pure Control, Pure Drive, Babolat AeroPro, Babolat Esense, and Babolat Drive Z lines. Not only are Babolat tennis racquets engineered for the professional play, but they also attract the recreational and competitive players of all levels. The GT Family of racquets takes the place of prior models in the AeroPro Drive and Pure Drive lines. These racquets feature Woofer, AeroModular, Zylon and many more Babolat racquet technologies to best suit your game. Gear up in all your tennis game requires right here at Sun & Sand Sports online store featuring the Babolat collection. Your comfort is a high priority at Sun & Sand Sports. You can shop as per your preference at our online store for your game’s equipment based on brand, size or color. Browse and shop from anywhere using any device – a laptop, tablet or smartphone – and have your product delivered to your doorstep anywhere in Kuwait.